On the 11th July 2018, over 90 parliamentarians from across the political spectrum, added their name to the Remembering Srebrenica Book of Pledges. By signing the book the MPs committed to stand up to hatred and intolerance and promote a fair, equal and cohesive society for everyone. Among those MPs who promised to remember the lessons from Srebrenica are Deputy Leader of the Labour Party, Tom Watson, Leader of the Scottish National Party in the House of Commons Ian Blackford and Layla Moran who is the Liberal Democrat Spokesperson for Education. 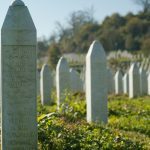 The former Leader of the Green Party in England and Wales, Caroline Lucas MP and the Vice Chair of the Conservative Party for Communities, Rehman Chisti MP, also signed the Remembering Srebrenica book of pledges.